My husband and I consider North Wildwood, New Jersey our second home and go down to Wildwood a few times every year. We absolutely love the North Wildwood area and plan on retiring there sometime within the next 10 years. Every time we go down to the condo we always make sure we stop in to Jurassic Golf for a few rounds of mini golf. This is an affordable 18 hole mini golf course that is super fun to play and is well-kept! As you go around the mini golf course you will find really cool statues of various dinosaurs from eons ago...including a really cool wooly mammoth! In addition to the cool dinosaurs you will find a few small bridges to cross and some pretty landscaped grounds. We love all of the challenging holes that this miniature golf course has to offer and those man-made waterfalls are absolutely gorgeous to look at. Rarely do we encounter a long line but we do usually go up there to play mini golf early in the evening before the crowds hit. 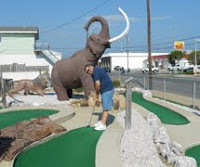 The Jurrasic Mini Golf is located in North Wildwood, New Jersey at 4th & New Jersey Avenues. It sits right on the corner and you can't miss it! (it is right across the street from WaWa. If you are heading down to the Jersey Shore (Stone Harbor, Wildwood or Cape May area) you will want to stop in and play a round of mini golf at Jurassic Golf! You and your family will have a great time...I can almost guarantee it! Make sure you check them out as they are one of our favorite mini golf courses in the Wildwood area!